This is first net-zero carbon house in UK that reaches the highest level of sustainability. Dubbed the Lighthouse, the highly eco-friendly house was designed to “encourage a way of living that is inherently ‘light’ on the world’s resources whilst combining the practicalities of today’s average homeowner. Almost all of us use the words green and sustainable interchangeably as if they have the same meaning. But the more one delves deeper into the nuances, the more this funny little feeling starts creeping in that there seems to be some interesting differences there in these two noble concepts. Why does it even matter? Simply because by being able to separate the two we can make better decisions as consumers and become more mindful and equitable participants in our society. The product manufacturers, as well as building industry would certainly benefit by embracing “Sustainable” vs simply “Green” practices. Whereas green addresses mostly environmental elements, sustainable takes a more comprehensive view, including environmental, economic, social, and cultural elements. For example, a more sustainable and socially responsible approach to manufacturing would entail a fair and humane treatment of overseas workers, while the building community would certainly include a standard of quality well in excess of mere code compliance for “green” construction”. You see, building a house out of vastly renewable wood from a thousand miles away or engineered lumber, installing solar panels and solar water heater to satisfy the energy needs of the building would be enough to deem it “green”. However, if the construction quality is poor and not much effort was invested into longevity of the structure and occupant comfort than such home will not be sustainable. As the word itself implies, a “Sustainable” structure would need to be “able to sustain” its intended purpose over time. In contrast, building a quality passive solar home out of reclaimed local wood where the house is designed to be heated and cooled using natural elements like the sun and wind is sustainable. It is more sustainable because such a house will require less energy and resources to build. It will be designed where every component of the house is engineered to compliment and enhance another and “fit like a glove” so to speak. This type of house will certainly require less maintenance down the road. 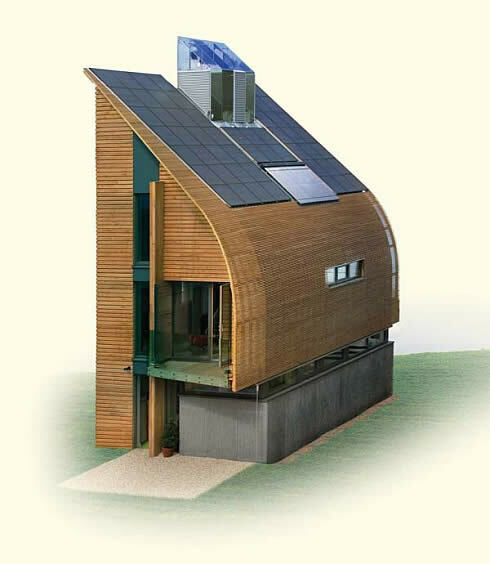 As a contrast, the house in the first example will eventually need to replace the solar panels and solar water heater. Recycling those components so far has proven to be a real challenge. As some green builders will attest, a truly sustainable home would be designed and built with a minimum 100 year life. It would be designed with a deconstruction plan, so that the components could be reused or upcycled at the end of their useful life. Ideally, these homes would also be built as a part of a bigger sustainable community . Another big difference between green and sustainable is the size of the property. One could technically build a very green 5,000 sq. foot McMansion but this home by no means could be called sustainable. Simply because these homes require substantially more materials and resources to build. This further goes against the basic premise of “sustainability” that encourages us not to borrow from nature more than we can put back. Not to say that a 2000 square foot home is entirely sustainable in this respect but it simply is more sustainable than a 5000 square foot Winchester House. Personally, I am very jazzed up to see a growing market for well designed and sustainable homes. Fortunately, evolving technology is slowly making sustainable construction cost competitive and increasingly common. The more available these homes become, the more their value is realized and demand increases. After all, once we get a taste of true quality how can we go back to the old ways of living in drafty, moldy and toxic homes? Green vs. sustainable is certainly a paradox! For example, the most common style of residential construction continues to be stick-built or homes framed of 2x lumber. Reinforced concrete is a better long-term alternative because it is immune to termites and gains strength with age. Also, the thermal mass of reinforced concrete proves advantageous in terms of energy efficiency when designed properly. Well designed homes and buildings of reinforced concrete will easily last hundreds of years with minimal maintenance (much longer than stick-built homes). Also, if torn down, reinforced concrete is easily recycled. Given current green trends, maybe we will see more residential reinforced concrete. I have a couple that I’m working on. One is almost complete. Reinforced concrete can be designed to withstand earthquakes both on homes and larger structures such as sky scrapers and hospitals. The homes I’m building have some dome roofs. Domes are the strongest geometric form available because an earthquake can shake it from any direction and forces have a direct path to travel along the dome surface and down to the foundation (no weak points). More conventional shapes are built to withstand earthquakes also. The structural engineer specifies the reinforcing steel details and concrete compressive strength to withstand earthquake loads. I think it is important to split up the terms “green” and “sustainable” because they do mean different things. A home’s design is “green” if its serves to reduce many of the harmful impacts buildings have on our environment and the home’s inhabitants. Whereas sustainable, in my eyes means, a home’s design is able to sustain itself (solar power) without causing irreversible damage on the environment (not merely reducing). I agree that just because a house is “green,” it is not automatically “sustainable,” and I actually also believe that is is hard for American homes to be both.